I believe Humana stock is still recovering from Dec '18 stock market correction and has the potential to match or even exceed last year’s high of $355. 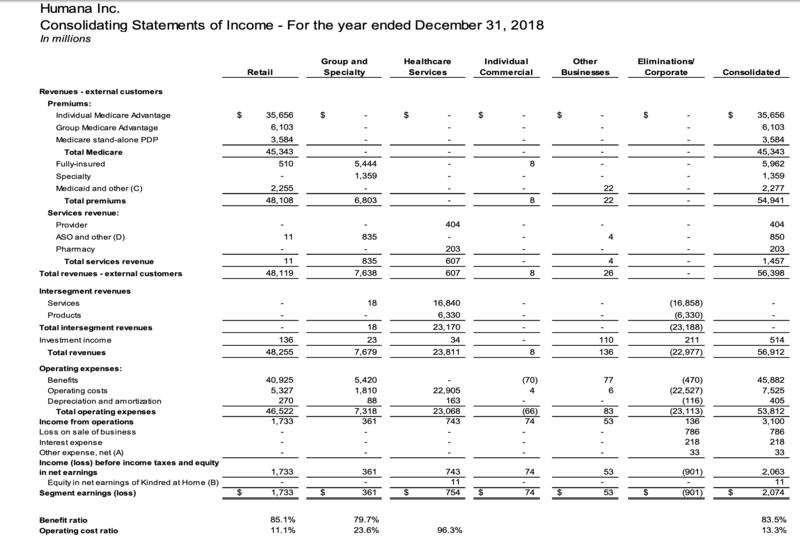 Q4 & FY18 results exceeded analyst expectations for 8th Quarter running with GAAP EPS of $2.58 and FY $12.16 and bold estimates for 2019 e.g. EPS range of 16.6-17.5. The company says it will grow its Medicare Advantage membership by 375-400k in 2019 - this segment is responsible for nearly 65% of company revenues. Trailing PE ratio of 25.07 versus forward PE of 18.07 implies strong growth potential meaning there is further value to be extracted. By implementing digital strategies that focus on collecting and analysing patient data I believe Humana can offer a more customised package to its customers. This will result in a reduced benefit cost ratio, increased membership and wider revenue margins. This is the way to win at MediCare. I have identified Humana as a promising growth stock for 2019 and beyond. In this article I discuss the recent steep drop in the company’s share price, review the company’s latest earnings results, explain why the company's push towards a more Personalised Health offering will help it drive profitability by becoming more efficient, and look at where the share price could go in 2019. 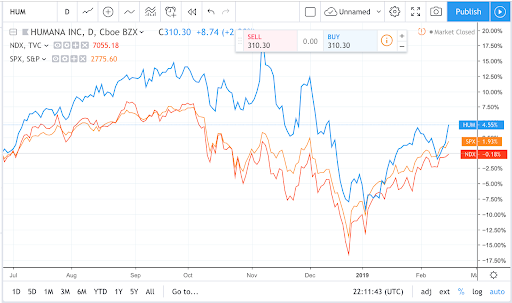 I believe now is a great time to cash in on a systemic dip in the stock market and buy a stock in Humana that is set fair to recover its losses and even exceed last year’s high of $355, resulting in a juicy 15% + gain for investors. Humana has recovered from a huge dip in its share price at the end of 2018. The correction represents one of the biggest in the company's entire history as a listed entity. Seasoned medical insurance market watchers, however, are unlikely to have harboured serious doubts that Humana would be trading at such low prices for long. As we can see from the chart above, Humana’s price dropped not because of poor company performance but as part of a systemic stock market collapse at the end of 2018, related to macro issues such as the trade war with China, government shutdown, concerns about the economy and especially poor performance by the biggest blue chip tech stocks. In 2019 Humana’s stock has already recovered nicely in tandem with the stock market as a whole, further fuelled by upbeat Q4 results this month that exceeded analysts already high expectations. At first glance Humana does not necessarily strike one as underweight. A healthy PE ratio of around 25 is in line with its listed rivals, such as United Healthcare (PE of 21.85), Centene Corporation (27.29), Anthem (22.08) and WellCare (28.97). Humana, however, has a strong 2-year interrupted track record of delivering on its EPS forecasts and the company has posted projected EPS of between 16.6-17.5 for 2019, giving a forward PE of approximately 18. What intrigues me most however is that the company's growth rate has been a little underwhelming in recent years, under the 10% benchmark at around 8-9%. Humana says that operating cost ratio will be in the range of 10.6% to 11.4% in 2019, a decline from last year's 13.3%, which is due mostly to the HIF moratorium. I believe that the investments the company is making into driving efficiencies within its core operations, using data driven analytics and new technologies to better capture and interpret patient data (e.g. Kindred at Home) and deliver more targeted and streamlined services are absolutely key. My thesis is that these investments will increase operating cost ratios and revenue margins, helping the company exceed its own growth predictions, and increasing income. This in turn will result in a lower price to earnings ratio that will appear highly attractive. But by the time the ratio is showing up on trading sites and being quoted by the company, it may already be too late to take advantage. I predict that a PE ratio of somewhere around the 15 mark is achievable for Humana this year. The company announced an EPS for 4Q18 of $2.58, beating management and most analysts expectations, and a FY18 EPS of $12.16 on a GAAP basis, and $14.55 on a non GAAP basis. Revenues in 4Q18 came in at $14,168m, a near $1bn increase year on year, with pretax income $436m. Why the discrepancy between GAAP and non-GAAP? Humana’s management says that a loss of $786m pretax, or $2.81 per common share, incurred by the sale of its wholly owned subsidiary, KMG, in 2017, was not included in the adjusted results. Neither were put/call valuation adjustments ($33m), amortisation ($90m), and segment earnings of approximately $74m ascribed to the now defunct individual commercial segment, which exited on Jan 1st 2018. Humana’s management puts the good results down to the strength of its core Medicare Advantage product. The above table shows that Individual Medicare Advantage was responsible for $35,656m of revenues in 2018; around 63% of the company’s overall revenues of $56,912m which includes the Group and stand-alone PDP Medicare schemes, Health Services and intersegment revenues. A recent Forbes article claims that more than 10,000 baby-boomers are aging into the Medicare population bracket every day. Humana CEO Bruce Broussard says the company is taking market share away from its competitors, and Humana's tech enabled services mean that the company is able to offer a wider range of services to its customers. This is a trend that the government, via the Centers for Medicare & Medicaid Services (CMS) is keen to encourage. Humana says that thanks to the moratorium on the annual Health Industry Insurance Fee, they were able to invest into operating efficiencies and productivity initiatives which were introduced during 2018, helping to drive membership growth in Medicare Advantage. Membership was also swelled by the enhanced benefits the company introduced into the Medicare Advantage schemes during 2018, which offset profits slightly, increasing the overall benefit ratio. Clearly, shareholders will be pinning their hopes on Individual Medicare Advantage membership growing even further in 2019, and Humana are confident that is exactly what will happen. What’s more, Humana’s products are outperforming in key states such as Florida, where they have secured a 5 star rated plan, and Texas. Humana also received a coveted award from Newsweek for "best in customer service among health insurance companies" in the magazine's’ America's Best Customer Service 2019 rankings. Chiefly driven by the Medicare Advantage Premium increases, Humana have announced initial guidance of non GAAP $17-17.50 EPS, representing an increase of 17-20% on FY18’s $14.55. 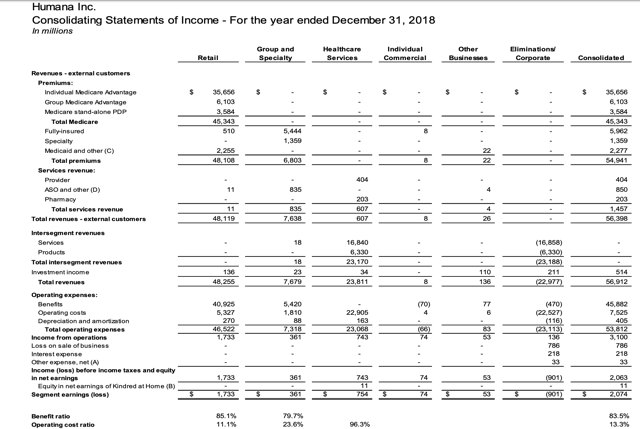 Just for good measure the company has also increased the dividend payout for 2019, to $0.55, from $0.5 - a 10% uplift. Significantly Humana also announced that they will be rewarding associates across all segments of the workforce, which numbers around 55,000, with “higher than anticipated incentive compensation”. A happy, well-rewarded workforce, is an efficient and motivated one, in my experience. Any More Reasons To be Cheerful? There are. The group’s Medicaid segment (which drives around $600m of revenues) has been awarded a statewide contract in Florida, which has been fully implemented at the beginning of January. The company’s TRICARE military health insurance segment, which covers 32 states, numbers more than 5m members and continues to perform strongly, helping to drive $7.68bn of revenues across the Group & Specialty segment, which represents a $230m year-on-year increase. As many healthcare market watchers will be aware this is a time of considerable flux within the industry. There is a shift towards a more personalised form of healthcare, using digitally driven analytics to try to provide premium holders with a more holistic, customised and commoditised healthcare package. Fear not, however. Humana have doubled down on efforts to embrace this change, as evidenced for example by their 40% minority holding in Kindred At Home. Kindred at Home is a Home Care services provider and what it enables Humana to do is to keep a closer eye on its premium holders, pay more attention to their specific needs, and store, process and analyse their medical records using a system called HomeCare HomeBase, which will be implemented throughout 2019.
gain a better overall understanding of their policyholder's behaviours. All of this will enable Humana to drive efficiencies in the way that they administer care. Ultimately, now that Humana is streamlining its services and laser-focusing on its growing and profitable Individual Medicare Advantage segment, it’s all about revenues vs benefits. Currently, the margin is fairly thin. The company’s benefit ratio for FY18 was 85.1%, whilst the operating cost ratio is 11.1%. The operating cost ratio is effectively a measure of how efficient the company is. Using services such as Kindred at Home ought to help Humana drive cost efficiencies, and increase the operating cost ratio, giving the company more breathing space, and bigger profits. The benefit ratio measures how much of the company’s revenues are spent on claims, and Humana’s has been climbing, to 85.1%, from 82% in 2017. Again, tech-enabled initiatives that have been carefully introduced during 2018, coupled with a greater overall focus on capturing patient data should help Humana deliver efficiencies across every aspect of patient care. This can be done more cheaply today thanks to breakthroughs in medical health technology enabling more sophisticated, faster, and cheaper digital analytics and insights. This is the holy grail that every healthcare company is aggressively chasing right now. Humana appear to be ahead of the game in this respect. Pricing plays a big role in this industry, and naturally, low priced insurance premiums attract customers, but also problems. For example, Humana say that they helped to pioneer the stand-alone PDP market thanks to a low priced deal with Walmart. Today, however, the market is now saturated with competitors, meaning Humana has lost market share. Once again, this is a problem that can be solved with technology, which can be used to ensure Humana gains valuable market knowledge unobtrusively and inexpensively. Meanwhile, the company’s decision to focus their efforts elsewhere is a mature approach, in my opinion. It demonstrates that Humana is conscious of its brand image and wants to do more than simply peddle inexpensive, but low quality health insurance. It has loftier aims than this, and that should be applauded. In my opinion it will be rewarded too. The company enjoys a good relationship with the US government, which is critical in this industry, and it is likely to be further improved by Humana’s insistence on providing a higher standard of care, through being disruptive and embracing new technological trends. In conclusion, pricing isn’t everything in this industry. A forward looking open minded and responsible approach is likely to be better rewarded, even making it easier to succeed in a low-priced market. At the time of writing Humana stock is trading at $308.39. One year ago the stock traded at around $275 but in November the share price hit an all-time high of $352.68. I would argue that is a more accurate price guide, as to return to my opening comments, shortly after this high the stock market as a whole tanked, and took down the vast majority of healthcare stocks with it. Nothing changed for the worse around Humana’s core operations or company performance, however, as the 4Q18 results prove. The company’s 2019 forecasts exceeded expectations. Humana have focused on improving its best performing segments and discarding non-performing segments. Sure, margins within the expanding Medicare Advantage market are thin, but we have addressed these concerns. With fewer business segments to focus on, and a focus on using technology to drive efficiencies and reduce the benefit expense ratio, the path to profitability is clearly delineated and crucially the company has buy-in from its motivated and well rewarded 55,000 strong workforce. I am forecasting a steady ascent in share price to November ‘18 highs, and even beyond. At current price, this represents a juicy 15% gain for investors. Factor in the increased dividend payout, also, and Humana looks like a highly attractive proposition. Are There Reasons To Be Fearful? Naturally, there are a number of issues that could upset Humana’s business model, both industry wide and company specific. During the recent earnings call analysts expressed concern about the company’s relatively modest growth and squeezed benefit ratio, plus the return of the Health Insurers Fee (HIF). These are material concerns, but in my view, Humana has done a good job of factoring these risks into its estimates for 2019. Growth is slightly behind the 10% target (at around 8-9%), but there are good reasons for this, including restructuring, and a refocus towards Personalised health and more patient targeted products, as I have discussed above. The biggest cloud on the horizon for Humana could be Bernie Sanders' announcement that he intends to run for President in 2020. Sanders wants to completely revamp the health insurance industry by introducing Medicare for All, which would eliminate private health insurance altogether. How likely is that? American citizens are showing support for Medicare For All in principle, but as Hilary Clinton pointed out in the 2016 Presidential Election, the strong likelihood is that Medicare For All is a political impossibility, costing in the region of $32 trillion to implement over a 10 year period according to a renowned think tank. Support for the scheme will dwindle as the inevitable tax increases are understood. The reality is that the pharma and healthcare industries are highly complex and tend to get an unsympathetic treatment in the media, who have a tendency to oversimplify and confuse matters. Humana’s has a proud history of lobbying the government and challenging them on key healthcare issues. So long as this continues, and they retain a strong bargaining position, and experienced board, they will not need to worry about the private health insurance market being liquidated anytime soon. Expect Humana's share price to continue to rise throughout 2019, and enjoy the higher dividend payout. The one sour note in the company's latest earnings report was the lack of growth. Expect this to change as the technology and operating efficiencies the company has carefully invested in during 2018 (as a result of the HIF moratorium) decreases the benefit ratio and widens profit margins, driving the stock price higher. Don’t tally too long, as the stock is already climbing sharply.